From Labor Day, Monday, September 6, through Sunday September 12, 2010 American labor will observe Union Label Week—the time traditionally set aside for union families and all consumers to make a special effort to support good jobs by looking for union-made goods and union-produced services when they shop. In these difficult times, when everyone is looking to stretch their paycheck, quality and value take on added importance—and that’s where union products and services beat the competition every time. When you buy union, you’re supporting good jobs in American communities, jobs that provide living wages and benefits, safe working conditions and dignity and respect for work. So, please join with us on Labor Day and the week that follows to celebrate the skills of union workers and honor the work they do by looking for union-made goods and services. 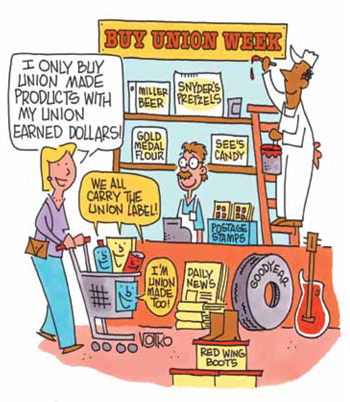 The Union Label Department has produced a special cartoon graphic to convey the Buy Union message. Please feel free to use it and help us promote the message.